UUJ, at long last, climbed off the bottom of Division 1A moving up two places to 12th after Saturday’s two-goal victory over Dunmurry Rec at the Factory Grounds. While Rathfriland Rangers are only one point behind, with the considerable advantage of six games in hand, the Jordanstown side can inch their way further up the ladder if they can make it three league wins on the bounce, with Dundonald Saturday’s visitors to Monkstown Avenue. UUJ manager Shane McCullough (pictured) told the Times: “If we can keep playing the way we’re playing, especially at home, and get a few points together it will give us some breathing space. Laurence Lyons lit the fuse after just five minutes, hitting one on the run, triggering a 25-yard rocket past the stunned Rec keeper. Shortly afterwards, Padraig Scollay, with a clear run in on goal, dragged one marginally wide of the upright, when squaring the ball to the better placed Dee Magennis might have been more beneficial. Scollay, however, made no mistake on 20 minutes – nicely controlling a Johnny Magennis pass before ruthlessly bulleting the ball into the far corner of the net. The UUJ striker could have been celebrating again minutes later but he pinged his penalty against the post, after impressive debutant Jason Devlin had triggered Dunmurry’s defensive alarm. It was soon time, too, for Devlin to satisfy himself with the quality of the other upright, with a curler from the edge of the box. UUJ were well in command, yet those misses could have proved costly but for two crucial saves from Eamon Browne in the dying embers of the first half. 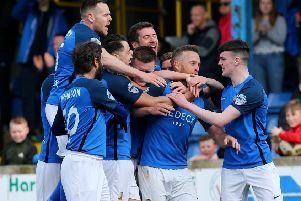 While Devlin was again denied by the frame of the goal, UUJ seemed content to see the game out in the second session, though there was still time for Browne to twice spring to the rescue, to stave off a late final fling from Dunmurry.